Yesterday, the cool, wet spring changed drastically. The temperature climbed to 25°C. Naturally I had to get out into the garden. It was quite warm! And the moist earth smelled wonderful. 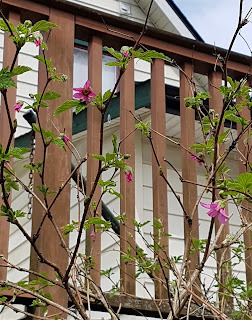 Early May bloom is happening as April flowers start to fade away. 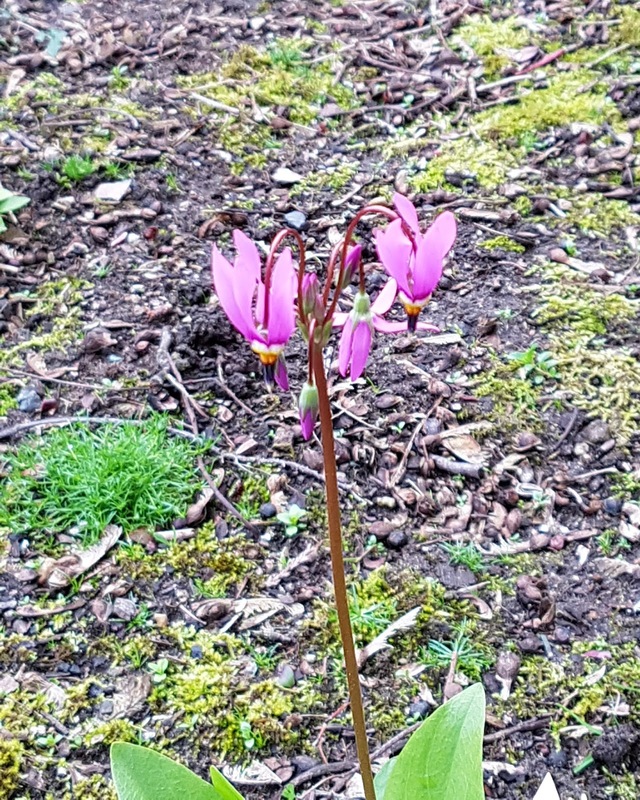 The pretty shooting stars (Dodecatheon pulchellum) that are happy have all flowered (a few are not so happy). Mertens' sedge, the grass that thought it was an iris, is making its funny little flower thing (the iris have not yet bloomed). Heuchera micrantha (alumroot) is starting to bloom. 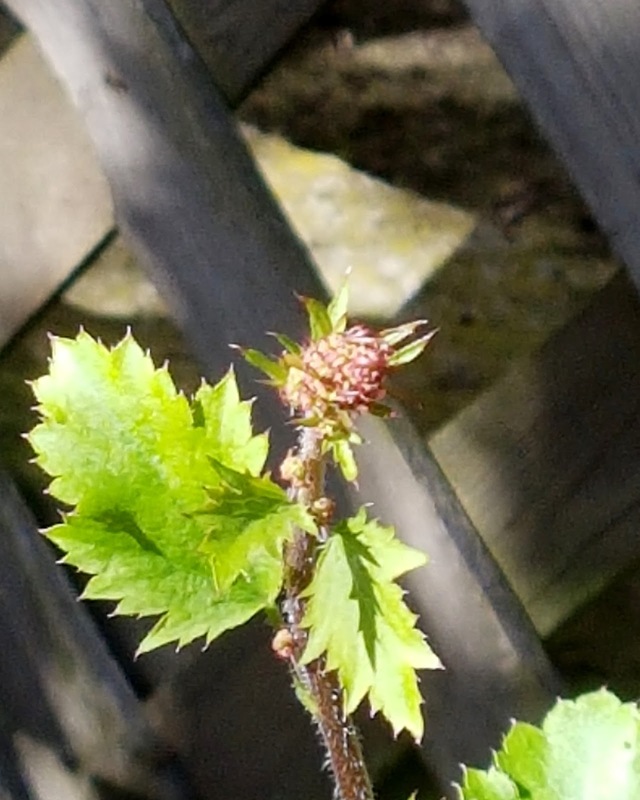 At this point, the flower looks like a small berry, but it should open up soon. Maianthemum racemosum (false Solomon's seal), which has stayed in a cluster, has made its white flower clusters. 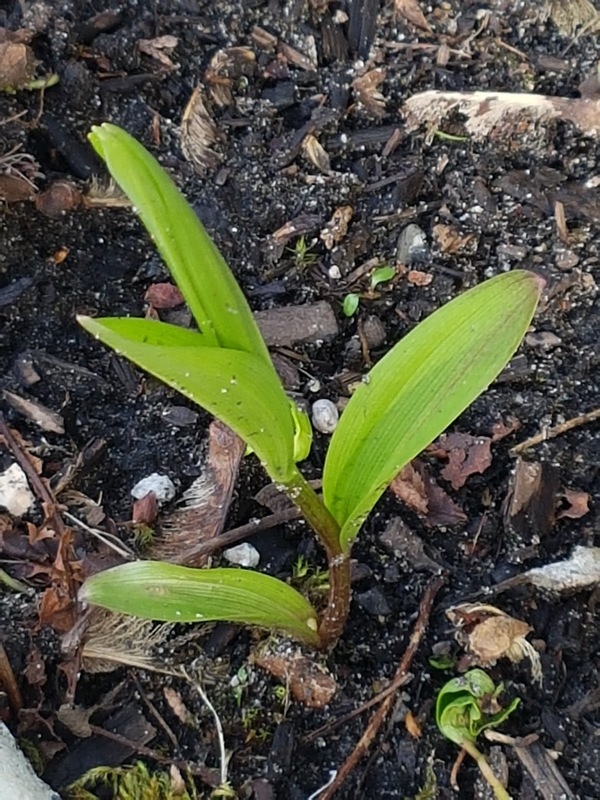 Vanilla leaf have flowered, and the false lily-of-the-valley are starting. Meanwhile, the Saskatoon looks like it will have pretty good fruit this year, judging by the flowers. Salmonberry less so (as usual). 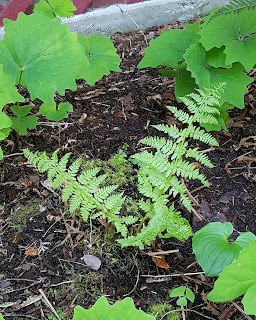 I have been on the hunt for the smaller ferns in the fern bed. The sword fern is large and dominant. The licorice fern is spreading on the lady's mantle roots (it usually grows on trees, such as the horse chestnuts in the nearby park). 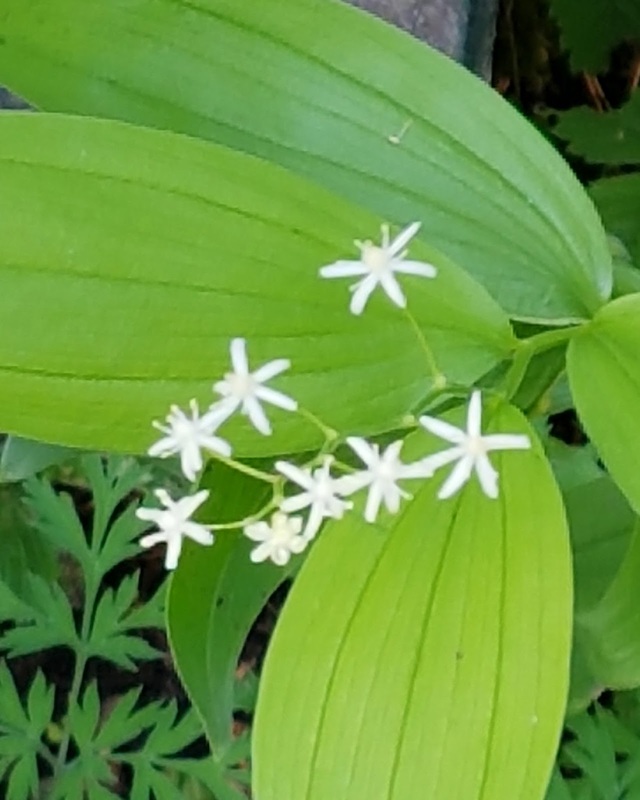 False lily-of-the-valley and vanilla leaf hold their own. But the smaller ferns can get lost and even snuffed out. Two out of the original three deer ferns (Dryopteris expansa) are coming back. I have made some space for them. One maidenhair fern is coming back as well. The tiny deer ferns, which were still there two years ago? Maybe not. But I have to be patient. We were supposed to be hit by a band of thundershowers last night, possibly with hail, but thankfully those did not materialize. It rained hard for a while and carried over to today. And the temperature is half of what it was yesterday afternoon and probably won't go much higher. I've been away from here for a while. 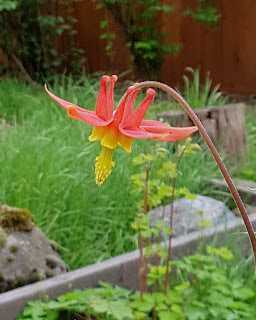 I have actually been out in my garden quite a bit, enjoying seeing first bloom for each flowering plant, the return of more herbaceous perennials, and the filling out of some of the beds. But instead of keeping up a blog I started only a matter of weeks ago, I immersed myself in software. First, photo management software, which is a combination of a more flexible view than Windows Explorer gives me and photo editing tools. And then, because that wasn't the database I knew I needed, some software that is a template for Microsoft Access (obviously I have Access and so theoretically could have set up the right tables, but I didn't want to invest the time). 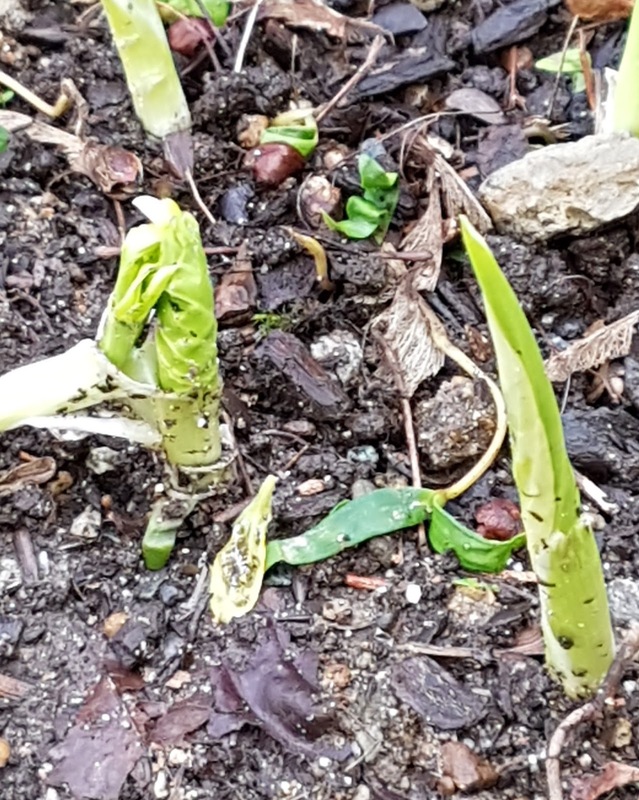 In my slight defence, it has continued to be a rainy spring, so there have not been too many days when any work was possible. The photo management software has been great. I have tagged all of my plant and garden photos with their scientific name, so I can then use keywords to view only a particular genus of plant from earliest to most recent (on the disk they're stored in folders by year). Unfortunately, its trial period is almost up. It's not really expensive, but I have to decide if I want to pay that for the view part of the software, since I don't care about the photo editing tools (at least not at this point). I will probably pony up, despite the sad Canadian dollar. The garden management template is not exactly what I might have liked, of course, but it's good and reasonably configurable. It looks clunky because it's 10 years old, but since it's really just Access it works fine. Data entry, however, is slow and time consuming. So far I have made it only through the A's. I don't want to get totally immersed in software and being a geek about tracking. But it's a handy thing to have. My Word tables are pretty cumbersome, especially when I want to add notes. Much work to do outside, however. I have to write about trying for a new balance between wild and tame. 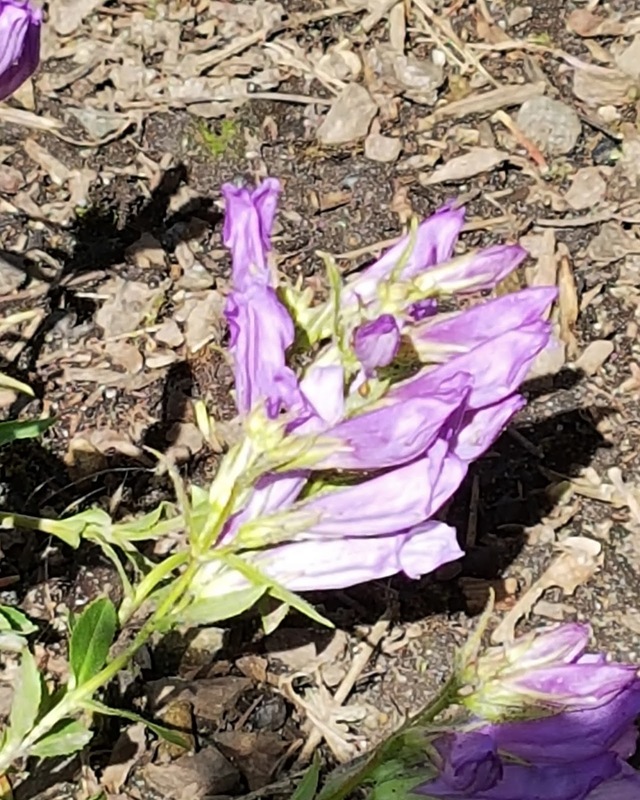 Addendum: the mystery plant turned out to be an invader, possibly from the ground next door, which got very dug up to remove an oil tank and all the bad soil. Gone plant. After having so much sunny garden time over Easter weekend, the week turned rainy or showery yet again. Given the way spring has gone, I'm sure the rain isn't over. It shouldn't be anyway. But it's good to see a bit more sun, a bit of warmth, and finally some bloom. Excitement 'round these parts! Okay, gardening excitement, which isn't quite the same. But still. The common name for Berberis repens is creeping Oregon grape. It has been growing very slowly in a shady corner near the front of the house. It's supposed to be small and low, so I assume it's thriving or at least doing well enough. It even had a baby (a nearby volunteer that so far I have left alone). But it had never bloomed that I can remember. That seems to have changed. These flowers are not quite open, but I think it's close enough to say this year the plant finally bloomed. Even the volunteer is doing so! Maybe this plant, which is a bit outside its normal zone, was not a mistake after all. Keeping an eye on it. The other Berberis are flowering as usual, much brighter yellow than this one. 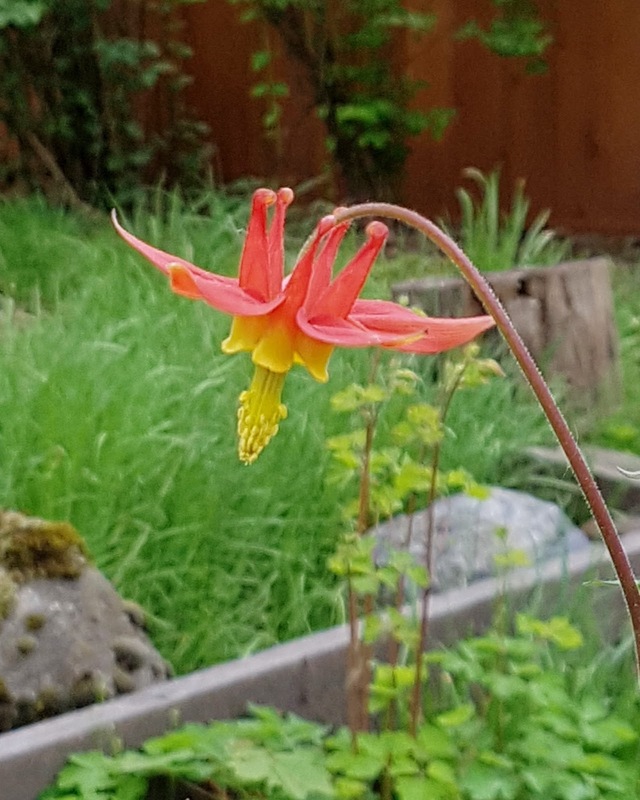 The lilies, yellow violets, and salmonberry continue to flower. 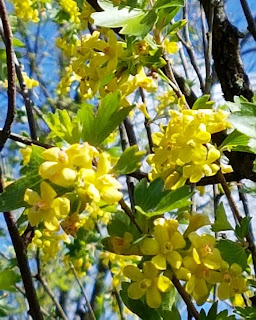 Ribes aureum (yellow flowering currant) is hitting it's bright yellow peak. The Oemleria cerasiformis (Indian plum) blossoms have gone by. 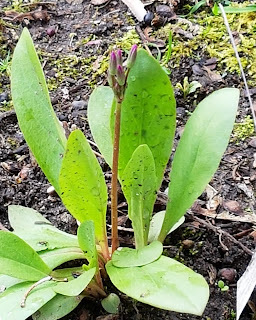 One of the Dodecatheon pulchellum (pretty shooting star) is just beginning to bud. I did even more cleanup of the Rosa nutkana. I was surprised to find yet more dead wood. Yet the hedge itself is still strong. I was going easy on it, but I probably should have trimmed off the top. It will need some trimming before summer is over. I did some more cleanup in the rock garden. On the shadier side, there is some major competition between Fragaria vesca, which goes everywhere, and Sedum reflexa, which likes to spread as well. I tend to let the strawberry go where it wants, since wherever it grows there is less room for weeds, but since this is the rock garden I decided that rock garden plants need more room. So I declared some space for the strawberry but pulled it out of large swaths of the sedum. 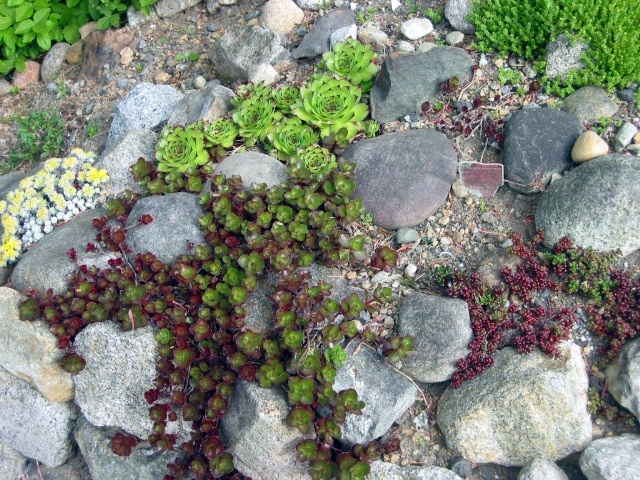 Back to battling to keep the rock garden in some kind of order! Otherwise it just looks like a shapeless pile. I arranged more of the plentiful rocks to try to create tiny beds again. We'll see how well I can keep the plants separate and not crawling all over or under each other. I have a mystery plant. It's right about where the ostrich fern (which is deciduous and disappears after it's done) ought to be. This doesn't look very fern-y to me, but there should not be anything else growing there. However, the ground on the other side of the fence was disturbed last winter due to oil tank extraction, so maybe something slipped over to our side. We shall see! I would love to see the return of the fern. 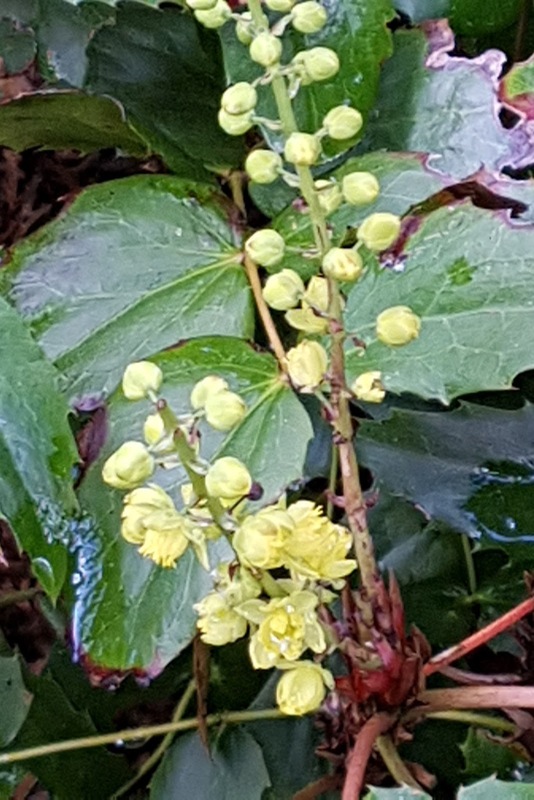 So far, despite the cool, wet, and seemingly late spring, some bloom is still ahead of where it ought to be: bleeding heart, all of the Oregon grape, and the flowering currants. The Indian plum was late. We're almost a month past the vernal equinox, but so far April has continued to be cool and wet. It seems like the garden is way behind where it ought to be. But really it's about in the norm. In recent years, we have had early springs. It's been many years since we had a more normal one like this. I have taken advantage of whatever non-rainy weather has come our way to get a jump on the weeds and undesirable sprouts. 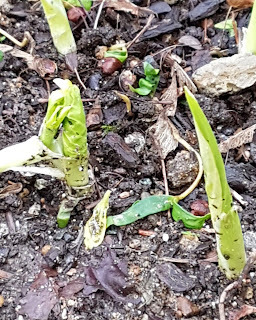 It took several days, but I have mostly cleared the hundreds of sycamore maple sprouts and done quite a lot of grooming around garden plants in the process. Even though there are quite a few plant beds in this garden, I find that it's worthwhile to get up close and personal with each of them. It just takes time and patience. This past long weekend (Good Friday is a statutory holiday in Canada) was a complete garden nerd-out. Not only was the weather mostly okay for working outside; I also started using a tool called Zoner Photo Studio X to get a better handle on years of garden photos. Outside, more is stirring. 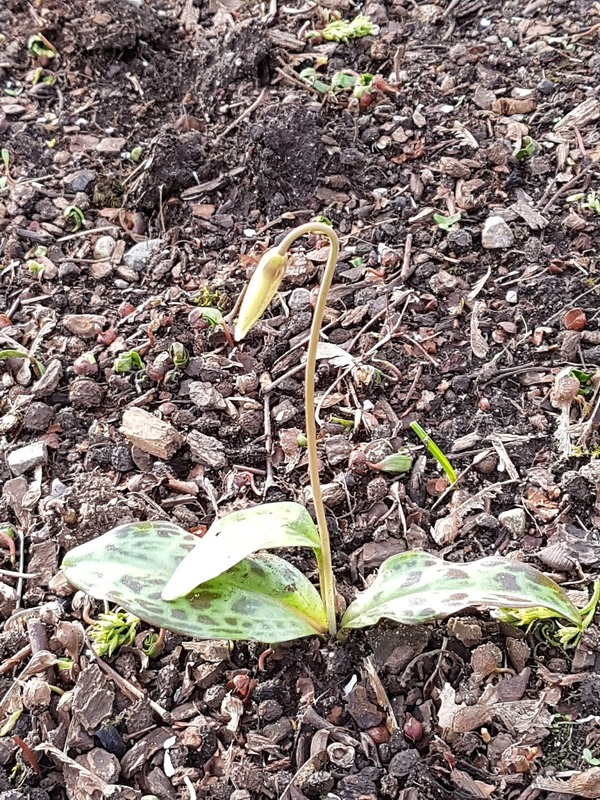 One Erythronium oregonum (fawn lily) flowered. 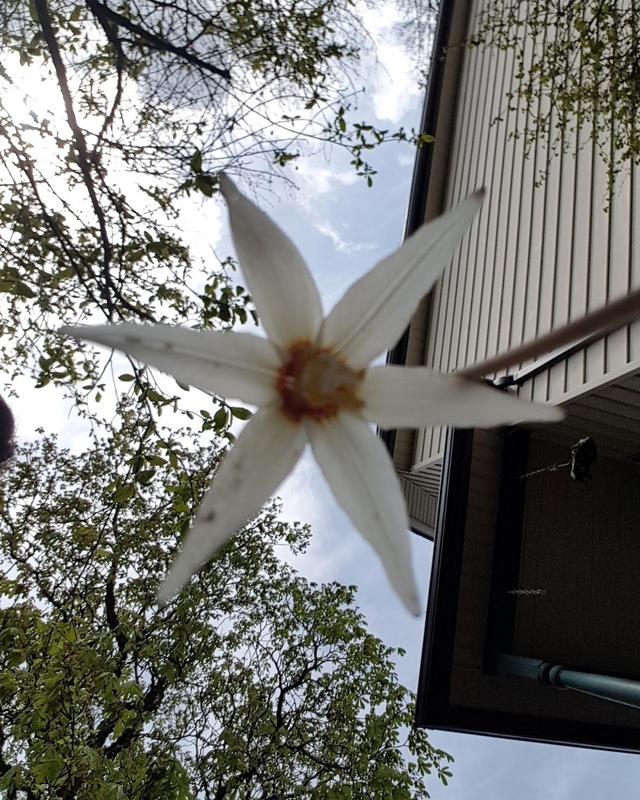 Its flower hangs upside down, so I had it take a selfie. Erythronium americanum (trout lily, the church plant sale rescue) has also started to open up. Two out of three Berberis are starting to open their yellow flowers (repens might not ripen again). There are lots more Dicentra flowers, of course.In the back, the Ribes aureum is turning yellow, and the Rubus spectabilis has just started to flower. I saw bees. A bumblebee on the Oregon grape. Another colony bee of some kind on the salmonberry. I have seen solitary bees as well, although I don't think there are any mason bees in the little house. I saw a ladybug on one of the lupins. We haven't seen enough ladybugs for quite a few years. I finally tackled the clean-up of the Rosa nutkana. It was a bit damaged first by falling roof debris and then by the tarp used to prevent more falling roof debris from messing it up. It has thinned out a bit, which isn't a bad thing. I have been able to clear a narrow path along the back of the hedge so that there is nothing growing right up to the basement. The roots have never come through any cracks, but they're strong, and I would rather keep them away if possible. I also was able to clear out a lot of dead branches that used to be hidden in the density. No glamour in this work. But I have to say that I have not spent nicer time off in a while. Even at this stage with lots of work and little reward, gardening is probably my best therapy. I can't remember which came first: the presentation at Douglas College on native plants, or the planned devastation of our lot. The devastation was a result of the demolition of a decrepit detached garage and the construction of a back deck/carport. When the machines were gone, the back yard was a mess of dirt and rocks. There was still lawn along the side of the house and in front. The native plant presentation fascinated me. I had never been that much of a gardener, but now we had our own house and some virgin territory. 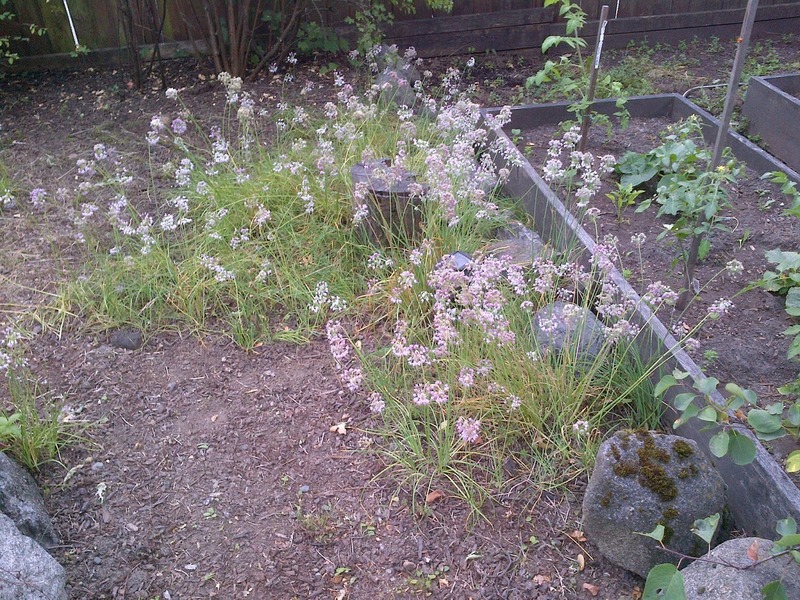 The idea of creating a native plant habitat was very attractive. A garden that would be good for bees and other local fauna, that would not need to be watered, that would flourish (or not) on its own. I can't find any photographs of the devastation, which would have been at the end of summer 2003. I know what I did to rehabilitate it. I thought about renting a Cat to level the area, but it's not that large and I decided to do it by hand. The land naturally slopes toward the south corner. I dug out rocks and got creative with some of them. There was a bunch of blacktop from an old patio that did not get removed with the other demolition and construction debris. I ended up piling that in the sunny centre of the back yard, over which I shovelled some of the sandiest soil and arranged rocks to create a sort of rock garden area. We didn't have a ledge, so I made one, and covered up a bunch of sins while doing it (which someday will need to be atoned for). Little by little, the place took shape. I found sources of native plants, I think starting with the annual sale at the Van Dusen Gardens. I created beds and paths around the rock garden. 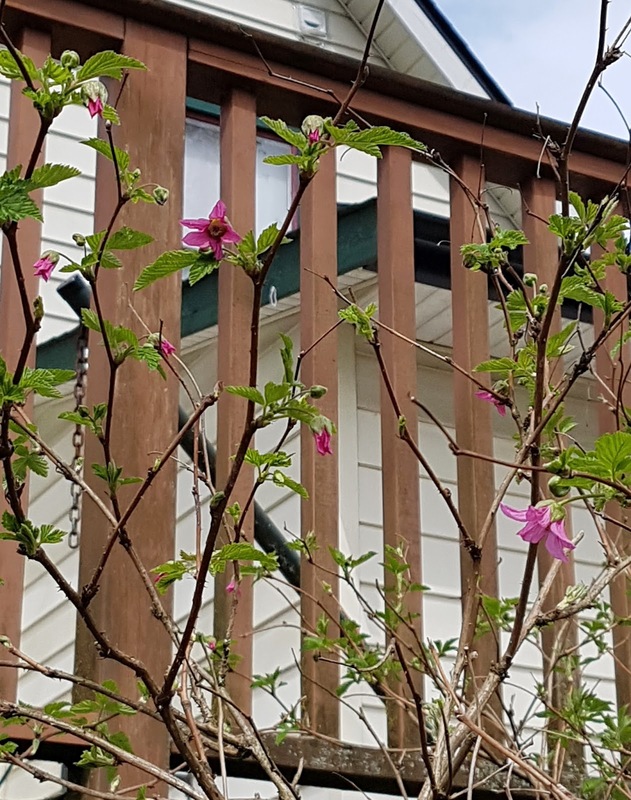 I planted trees and shrubs around the perimeter, some large shrubs near the back deck, and lots of smaller plants in between. The earliest photos I have are from March 2005, by which time I had put in quite a few plants. 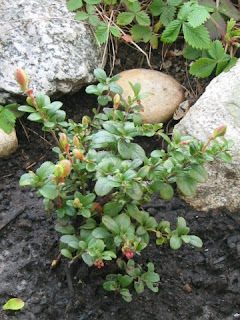 That Vaccinium (the lingonberry in the top photo) did not thrive and is long gone. I don't even remember having chosen that one! The specimens all looked great to start with, but my experiments in placement did not always work. The soil is acidic, which these plants like, but it lacks clay. Thus it drains well but there are few spots that hold moisture for any length of time. By that time I took photos, we had cleaned up the back yard, and I had removed the turf from along the side fence to create a bed for shrubbery. As you can see at the right, the Ribes sanguinium (red flowering currant) was already thriving. I believe that original is now gone, and the second that I planted nearby is the one that's there now. Looking at the oldest photos, I notice how manicured everything looks. The garden was more like a garden when I started and less like a habitat. Over time, I determined that these plants aren't all that great about staying put in nice neat beds. 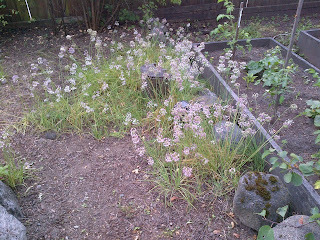 I also determined over time that it's not a bad idea to let these plants find the best site for themselves. It was a long, slow process to remove the turf from the rest of the lot. It's also the kind of thing that tends to alarm one's neighbours. 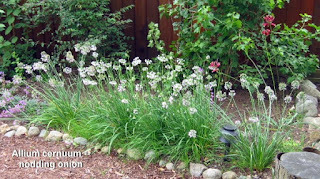 There was not much conversion of lawn to flowers or food or both at the time. But I was inspired by front of the house of our neighbours (both in the horticultural trade), which was all garden, and I did not hear any objections to my efforts. I don't know why I didn't create this blog years ago. I have occasionally slipped garden posts into my general purpose blog Fromage, but they are among the least viewed posts in the blog. That makes sense. Garden posts are interesting only to garden people. I also have a Tumblr called long wave that started life as a fashion blog, turned into a music blog, and ended up as a plant blog, but I have never found Tumblr to be a very friendly platform. Too old for Tumblr, I guess! If this is going to be a nerd blog, I might as well do it in nerdly Blogger, which I know well (I'm not nerdly enough to deal with Wordpress). The garden makes up the entire lot. There is no lawn. 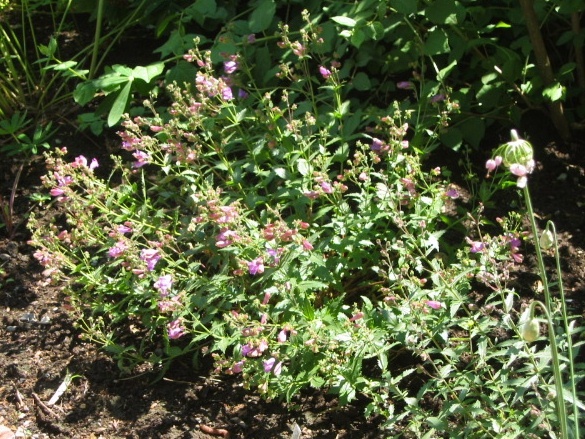 Most of the plants are native to the temperate zone of the Pacific Coast of North America. The garden is xerescaped: if a plant does not thrive without water after a couple of years (young trees get a few more years), then it's not in the right place. The only watering in this garden is for new plantings, newer trees, and the occasional herb or vegetable. As of today, we are in the midst of a cool, wet spring that followed an unusually long, cold, snowy winter. The rain has often been relentless, as it has been today, and the ground is sodden. The previous summer was not a hot one, but the summer of 2015 was the one with record heat and drought. You just never know around these parts, especially with climate change rearing its ugly head. In recent years, there has usually been a lot of bloom by mid-April. 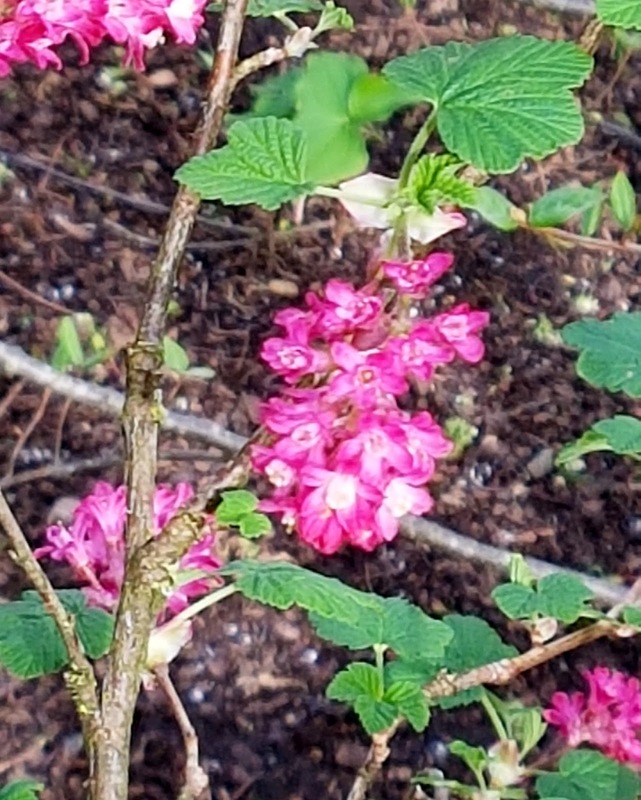 This year, however, all I have so far are the Ribes sanguinium (above), Oemleria cerasiformis (faithful Indian plum), some Viola glabella, and one surprising Trillium ovatum, and hints from a few other plants. The Mystery Church Plant Sale bulbs are usually the first to flower, but they are not opening their buds yet. 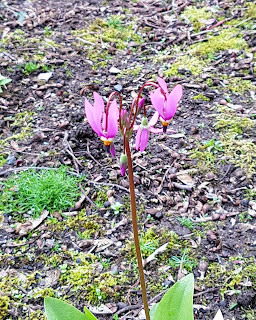 Same for the fawn lily (Erythronium oregonum, at right). It's as though most of the flowers are not ready to commit to spring just yet. Who can blame them? While flowering waits for at least a bit of sun and warmth, there is a lot happening in the foliage. The large patches of Dicentra formosa (Pacific bleeding heart), which were among the areas damaged by workers, are looking perky and are displaying some deep pink buds. I want them to go back to spreading into wherever they thrive. The Asarum caudatum (wild ginger) has been badly stomped over the last few years, and the right side is looking sad. But the left side has darker leaves and is even starting to spread outward toward the front. Particularly good to see are the Maianthemum stellatum (I think, can never remember which is stellatum and which is racemosum until they bloom) spreading not only around the dogwood but also out beyond the fence by the sidewalk. Glad to see the rizomes doing their thing. The more false Solomon's seal (and anything else desirable), the less room for weeds and maple sprouts. The maple sprouts are where I have spent many hours recently plucking up a couple of green bins worth of sprouts. 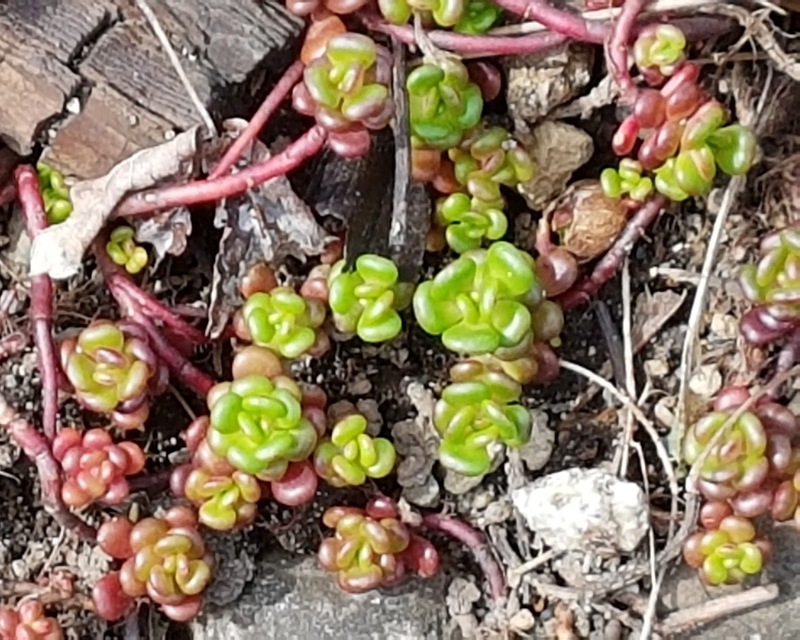 A lot of them were nice enough to cluster on the remaining leaf litter, so getting rid of them helped with cleanup anyway, but there are always more than enough sprouts to go around. Not done yet, but most of the sprouts are gone for now. Today was curbside pickup day. By now I might have an empty green bin. If the rain stops, it won't be empty for long.